GETTING AHEAD: Joey Martin puts Cardiff 2-0 up on thenight. THE record books will show Cardiff Devils beat Sheffield Steelers by three goals in this Elite League play-off quarter-final. In reality, it was much, much closer than that. Having lost their-head-to-head series against Cardiff 5-1, nobody expected the Steelers to make it through to the Final Four Weekend in Nottingham. STOP THAT: Jackson Whistle was kept busy at the Viola Arena by Cardiff Devils. But they gave it everything they had and, with just over 10 minutes to go, they had one foot in the semi-finals after two goals in 47 seconds inside the first two minutes of the third period put them ahead overall. But Cardiff showed why they have been league champions for two out of the past three seasons when they plundered a quickfire double of their own to regain the lead before making sure of progression to the National ice Centre with two late strikes to win 11-8 overall. 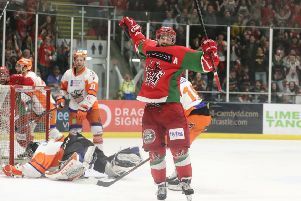 Steelers had enjoyed a near-perfect 45 minutes on home ice the previous evening when they found themselves 5-1 ahead, only for Cardiff to come roaring back in the final quarter with three goals. Barrasso's team had endured only misery on their previous three visits to the Viola Arena - losing 7-1, 7-3 and 6-0 - and, given Cardiff's late rally the previous evening, knew they would have their work cut out to hold onto their slender advantage. HEAD MAN: Sheffield Steelers' head coach Tom Barrasso on the bench in Cardiff on Sunday night. Picture courtesy of EIHL. As expected, Cardiff came out full of intent, forcing the Steelers on the defensive from the off and it wasn't long before they drew level overall, good work down low from Joey Martin seeing him shake off the attentions of Aaron Johnson on the boards to advance on Jackson Whistle's net where his half-shot saw the puck fall to Sean Bentivoglio alone on the far post to tap home with just 4.03 on the clock. The Devils kept on coming thereafter, the Steelers occasionally breaking the siege on the goal with Ben O'Connor and John Armstrong both testing Bowns in what quickly developed into a fiesty, physical affair. The Steelers looked like getting through to the first period break on level terms overall but, when O'Connor headed to the box on an interference call, the Devils went ahead in the tie when Martin prodded home rebound from close in at 17.46. Having shown encouraging signs in the first period, the Steelers delivered on their promise and willngness to go toe-to-toe with their hosts, but it came from an unexpected situtation when, with Evan McGrath in the box on a roughing call, Josh Pitt's breakout pass was seized upon by Jordan Owens, who raced clear to fire over Bowns's right shoulder to level the overall score just under two minutes into the second period, down 2-1 on the night. The second period was a more even affair and Steelers had a number of chances, while Whistle and some deserpate defence kept Cardiff out at the other end. That was until Devils defenceman Mark Richardson followed in his own shot to poke home the rebound off Whistle and hand he initiative to the hosts once again at 27.37. That was how it stayed until early in the third when the Steelers stunned the Devils with two goals in 47 seconds. Eric Neiley was first to pounce just 26 seconds after the restart, punishing Bentivoglio's mistake before further pressure from the visitors saw the puck fall to O'Connor, who found Owens on his own in front of net, leaving him the simplest tap-ins to draw Steelers level and put them 7-6 ahead overall. But Cardiff kept coming and replied with a quickfire double of their own, Layne Ulmer's power play strike at 49.40 tying things up again before, just 39 seconds later, Josh Batch got the hosts back in front again. 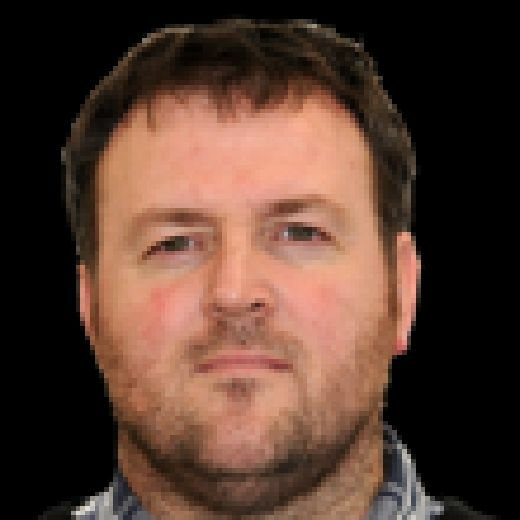 The Steelers still created scoring opportunities of their own but couldn't find a way past Bowns and they were made to pay when Martin extended Cardiff's lead at 53.21 before a late empty-net strike from the same stick sealed his hat-trick brought about a disappointing end to proceedings for the Steelers and departing head coach Barrasso.